Pinks on the Pin Cushion! I've had this pin cushion hat for many years. I think it is made around a piece of a big oatmeal box ... it is about that size! The baubles are 1960 vintage and I wear them frequently! I've collected things like this because my Mother's generation loved these things and wearing them makes me feel connected! January is such a blah month, I love moving things around that remind me that spring will come, eventually! I'm linking to Pink Saturdays and Tabletop Tuesdays, so make sure you click through to visit the other posts! I'm posting a series of photographs that are three years old! When Miss Phoebe was two, she loved "wing wings"! Actually, she still loves penguins, but we had this party right after Christmas back when she couldn't say "penguin"! 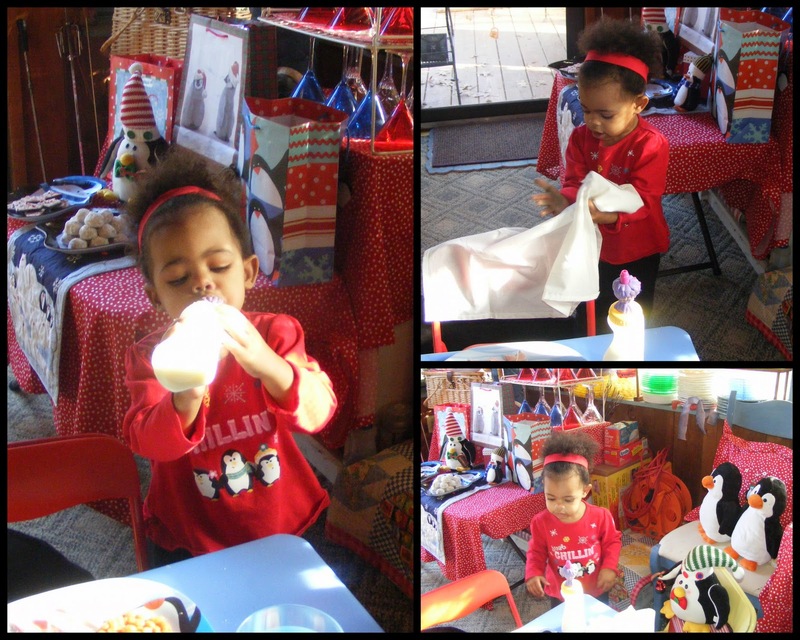 I decorated the entire sunroom for the party and had goodie bags and all kinds of cute things for her to play with and take home. came from the Dollar Tree! crammed too much in that room ... for her to play with! 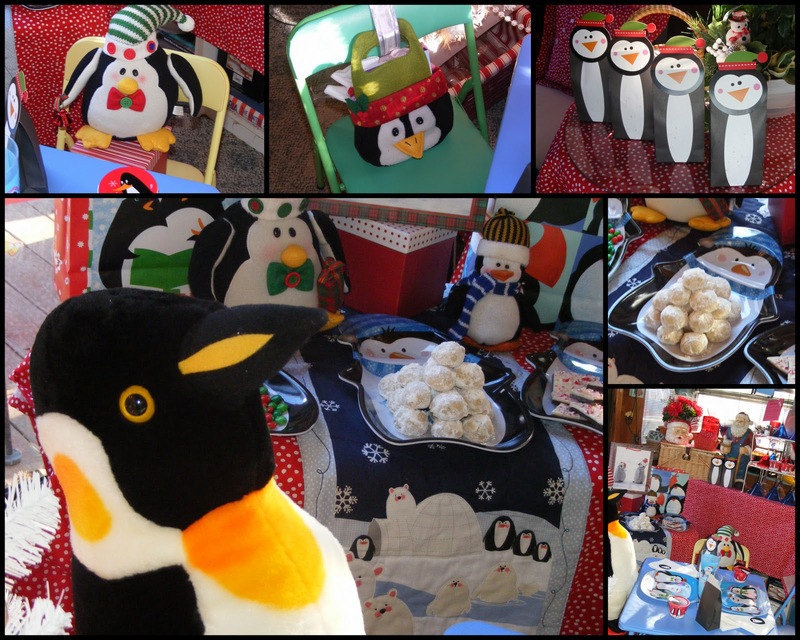 Nothing better than snowball cookies for a penguin party! You might call them wedding cakes ... sometimes they are balls and other folks make them in the crescent shape. I'm posting this trip down memory lane with Tablescape Thursdays and Potpourri Friday, so make sure you click through to visit all the other posts! Check out my home page to see my snowman post, a new friendship bread recipe ... and a few other things. As much as I wish Spring was just around the corner ... it isn't! 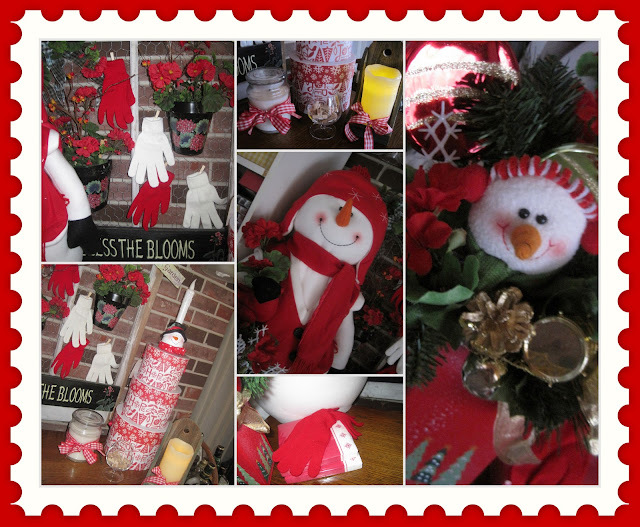 So, I am happy to decorate with this cute snowman and all the other red and white items ... for another six weeks! I grabbed that big snowman and the round boxes at the 90% off sale at JoAnn Fabrics the other day and knew exactly what I wanted to do with them. My friend, Liz, gave me the snowman arrangement in the tall red can for Christmas ... and I knew all these things combined would be really nice. 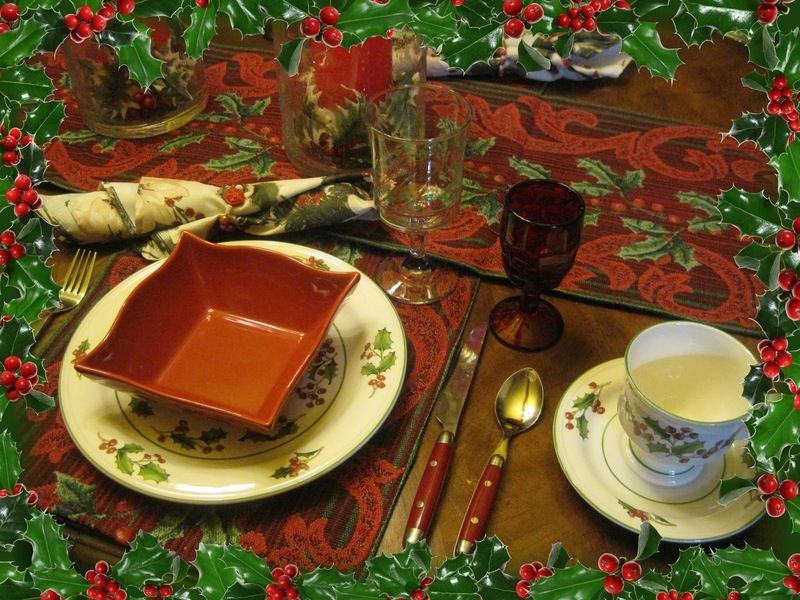 I'm having a fondue luncheon soon, and my table will be red and white, so I wanted to set the same theme in the sunroom where I plan to serve my luncheon. You'll have to wait a couple weeks to see that tablescape ... but I hope you drop back by later! RIGHT HERE! I just keep adding geraniums to things! I'm linking to Tabletop Tuesday, so don't forget to click through to see the other posts! Before you go, though, visit my home page to see my other posts! This is a perfect post for Rednesday, so make sure you go see those entries, too! ... and I'm posting with the Friday Charm of the Home Party! and Seasonal Sundays! Be sure and take a look. Another Friendship Bread Starter Recipe! Whip until well blended. Pour the batter into a prepared 13 x 9 inch baking dish. Sprinkle 1 cup of sliced almonds and 1 cup of chocolate chips over the top of the batter. Bake at 325 degrees for 1 hour. 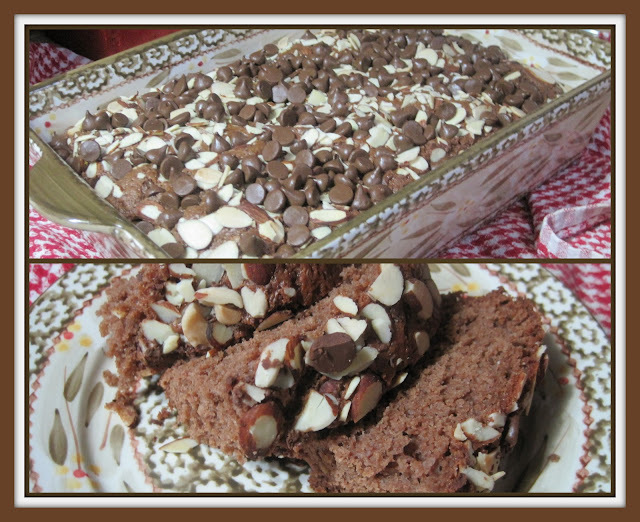 This cake isn’t too sweet and makes 24 snack cake servings. I love this picture! My daughter and I were at a conference, attending a social function in a comedy club. The conference photographer wanted to take pictures, but the place was so dark, he couldn't get many! We just held the candle up ... and here's the result! Yes, we look a little bit alike, but PhD daughter is much smarter than her mama! We love working together, though. I frequently visit her classes ... she teaches Hospitality and Tourism Administration ... and I'm an 'old' expert ... The college students can't believe how much alike we are! 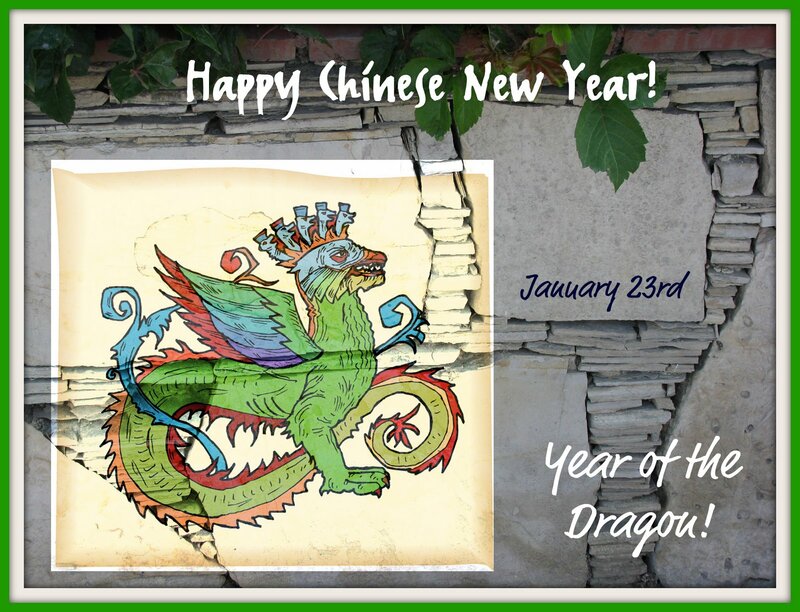 Happy New Year - Dragon Style! a couple dragons to a fabulous dinner! Pink Saturday Lilies and Hearts! 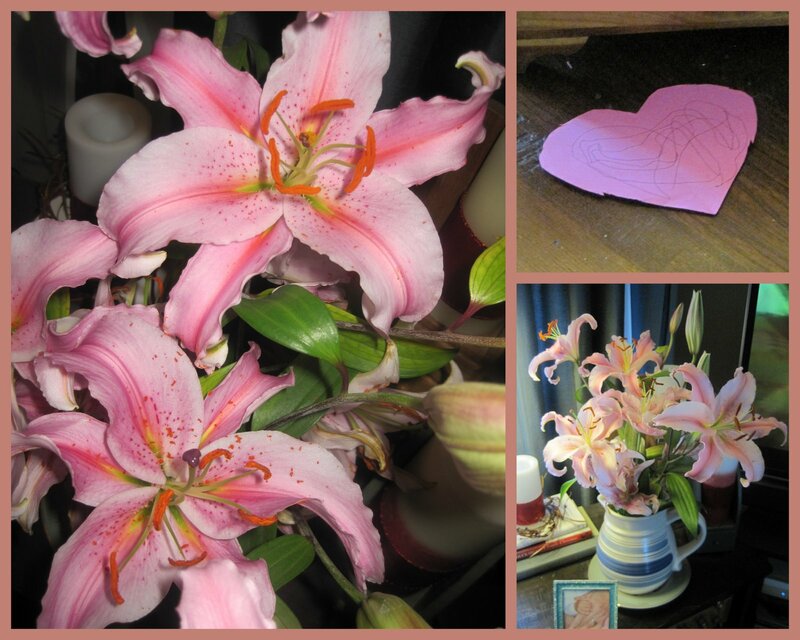 Don't you just love these beautiful lilies? Some of the university students I work with gave me these for my birthday! They smell so good ... and that special heart is from Miss Phoebe. She's learning how to use scissors and with a little patience, she can fold the paper and cut out hearts. All that special writings says "happy birthday, Gwamma"! Such talent. I'm sharing my pink with Pink Saturdays so make sure you click through to see the other very pink posts! But, first ... go to my home page and take a look at my other posts. 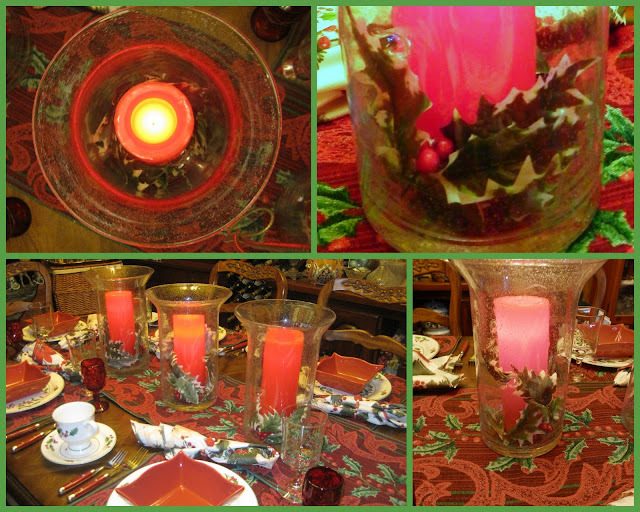 I still have a couple pretty holiday tables and a video of most of my tablescapes from 2011. Isn't this the most adorable miniature cedar chest? It looks almost exactly like my big one ... and right now, I have placed it on the coffee table ... just to look at! 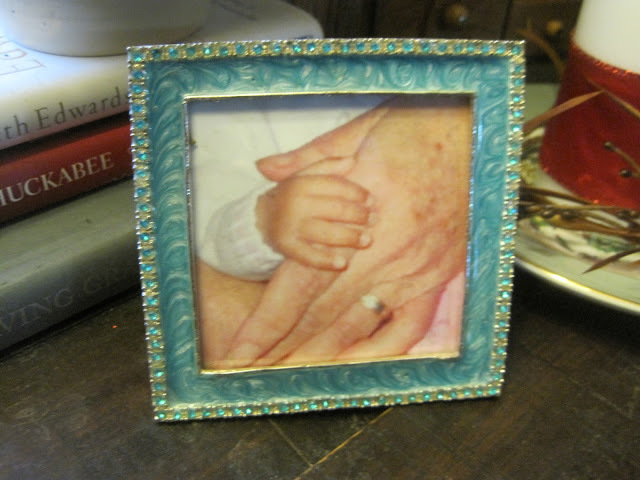 I brought it straight home from an antique store last Saturday and put it on the table. I didn't even polish it! 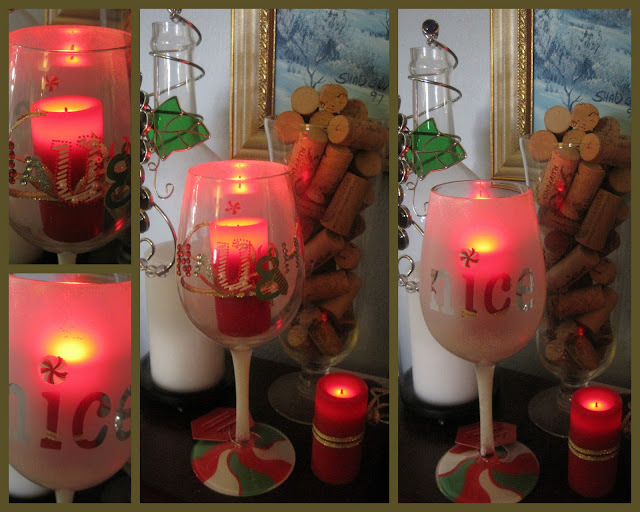 I have big plans for it and you'll see it in a future tablescape for a wine tasting party! For now, I'm just enjoying the cute little thing! I'm sharing this through The Charm of Home, so make sure you click through and look at all the other posts! Looking for Friendship Bread Recipes? If you'd like additional Friendship Bread recipes, click the "Recipes" button on the navigation bar and you'll find them! 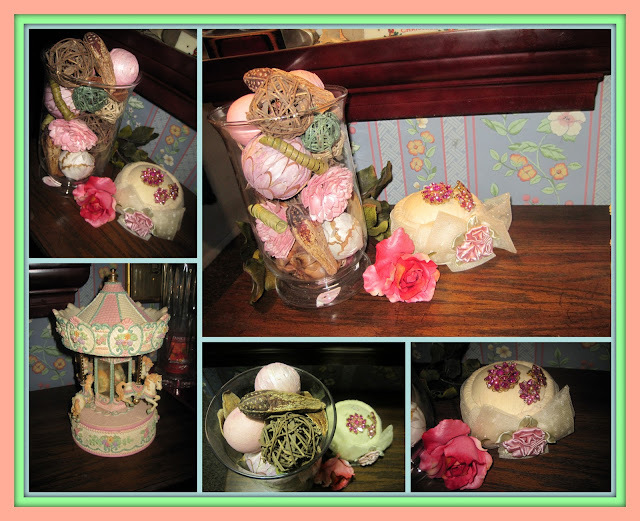 Take a look at my video slide presentation ... several of my tablescapes from 2011 are shown. If you like this, click through my YouTube button and watch some of my other videos! 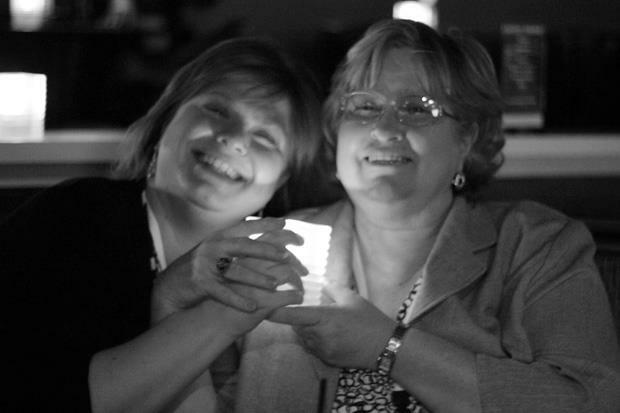 I'm linking with the party at the Charm of Home and with Feathered Nest Friday Make sure you click through to see the other posts ... and thanks to our hostesses for giving us the opportunity to come together! I'm also posting with Pink Saturdays, so make sure you click through to see the other posts. 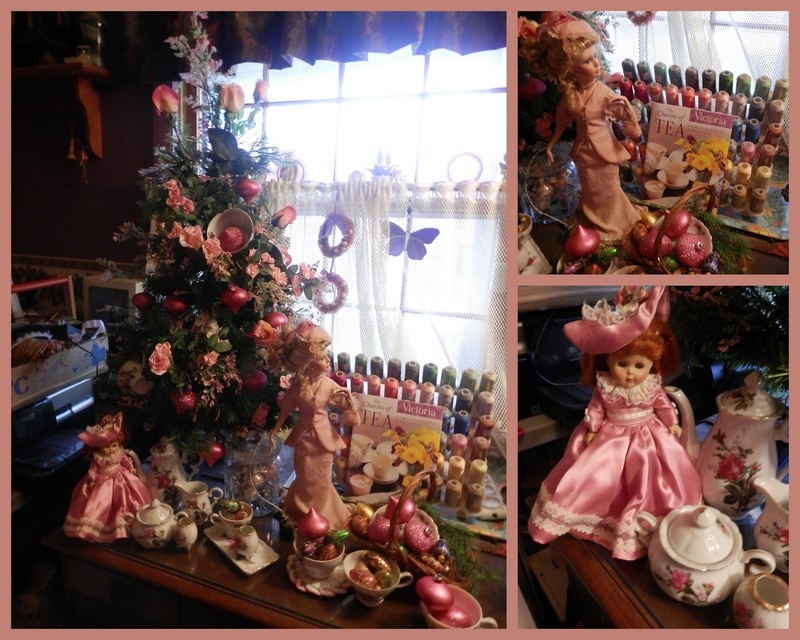 Here's one more collage of pink, before the little tree comes down. This pink is in my sewing room ... and includes a couple of my little dolls! I'm just curious about the kinds of things that people find second purposes for ... especially in your households! My favorite is to reuse the big bag that my dry dog food comes in. It is foil lined and has a zipper closure ... so it makes a perfect heavy trash bag ... used best when you are going to have lots of chicken bones ... or scraps from a heavy food preparation day. It zips closed ... no bad smells!!! I have also used them as the second bag for bird feed ... ears of dried corn or bird seed. What do you save to use again ........ and don't tell me aluminum foil! leave me a comment ... and I'll eventually post the list of ideas! 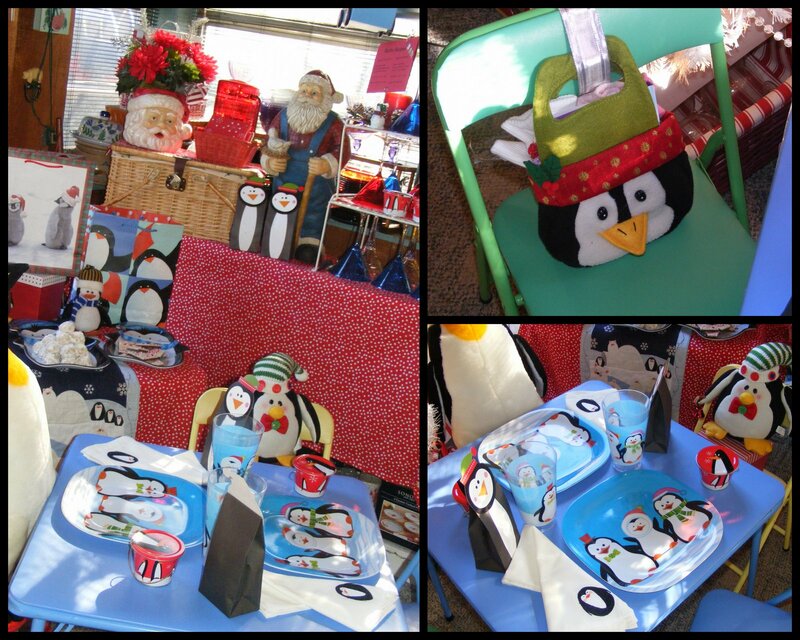 I didn't post much during the holiday season, but wanted to share some of my wintertime tabletops! I hate taking down Christmas decorations, so this year I decided to use some things that are "winter decor" ... that I can take down when I'm ready to! I might not be ready for a couple months! Let's start with the hallway bathroom! Maybe you saw this cute shower curtain with matching towels at Kohl's. 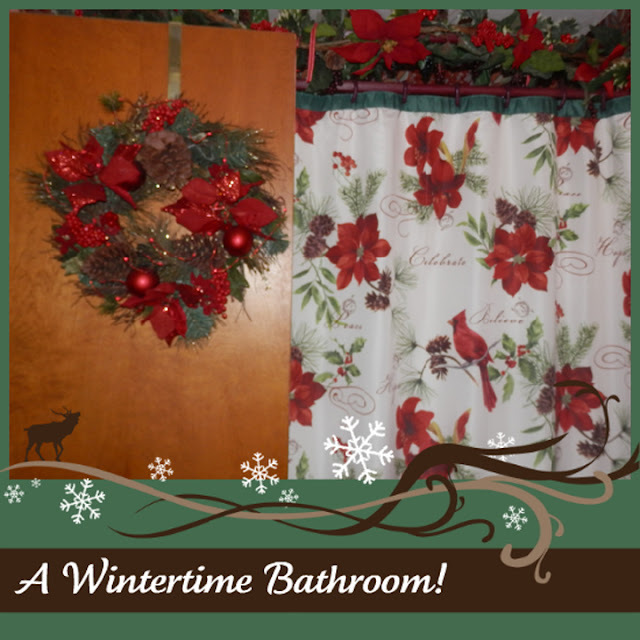 I thought it would look great and I topped the curtain with a thick poinsettia and pine cone garland that matched the wreath on the bathroom door. 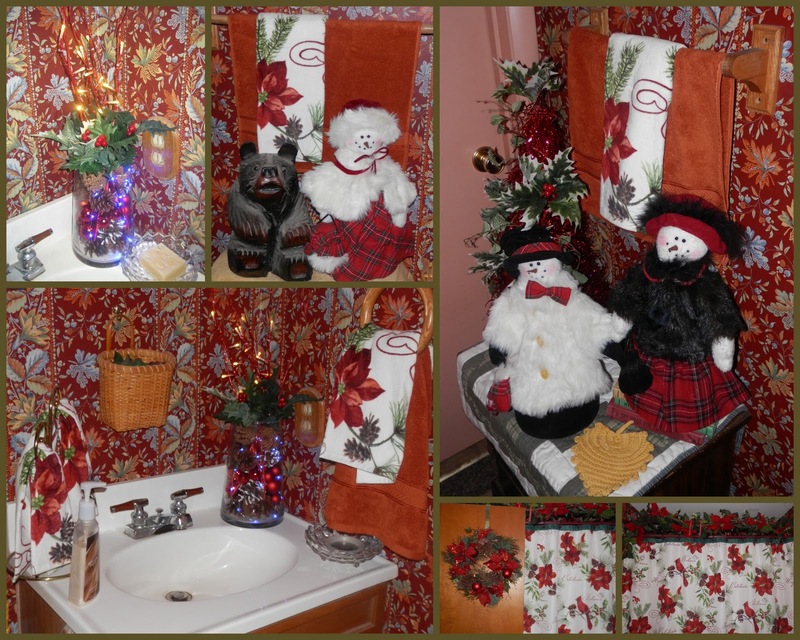 I used snow ladies in the bathroom, all decked out in their fur coats! Black bear lives in the bathroom, but he is happy to have some wintertime friends! A corner arrangement was an easy composition and includes battery operated strands of lights. The living room is easy to decorate for Christmas, because I have so much red in that room to begin with! 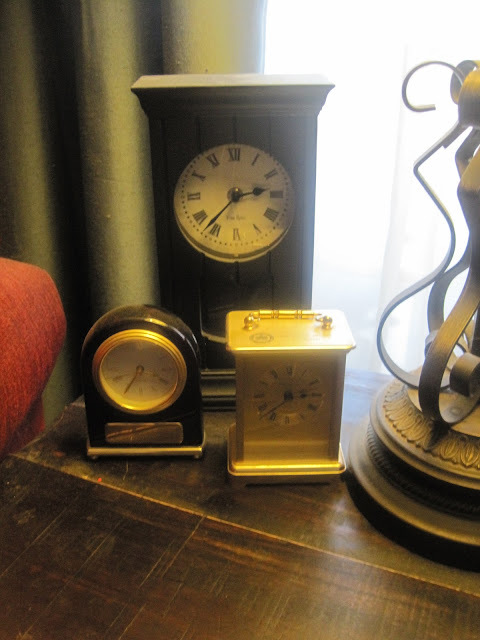 A simple arrangement, which is also lighted with a strand of battery operated lights, sits on a stack of my husband's leather cigar boxes. 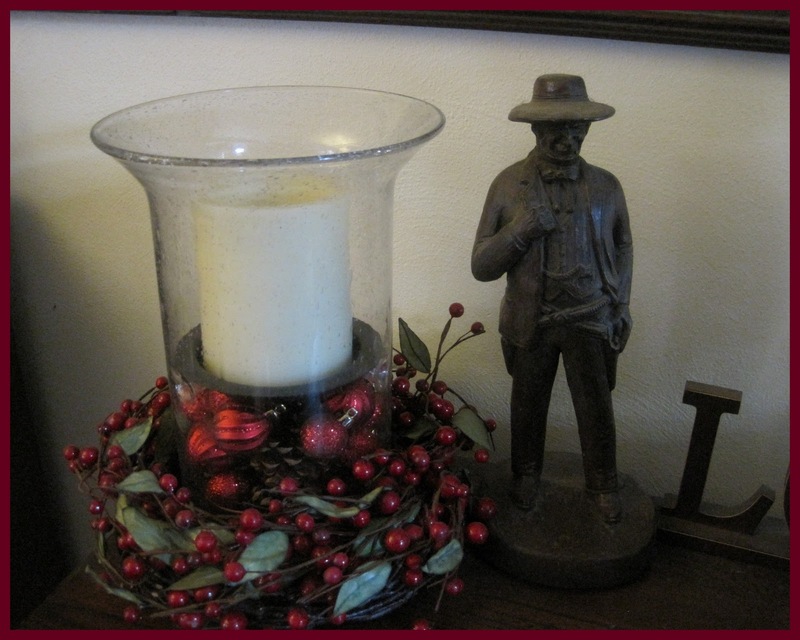 My husband's bronze cowboys are all over the house, but this one stands guard over a hurricane filled with red glittery ornaments and surrounded with a wreath of berries. Daughter gave me this cute wine glass for Christmas. It says "nice" on one wide and "naughty" on the other side. It's too cute to drink out of, so I added it to one of my wine tabletops, with a flameless candle inside. 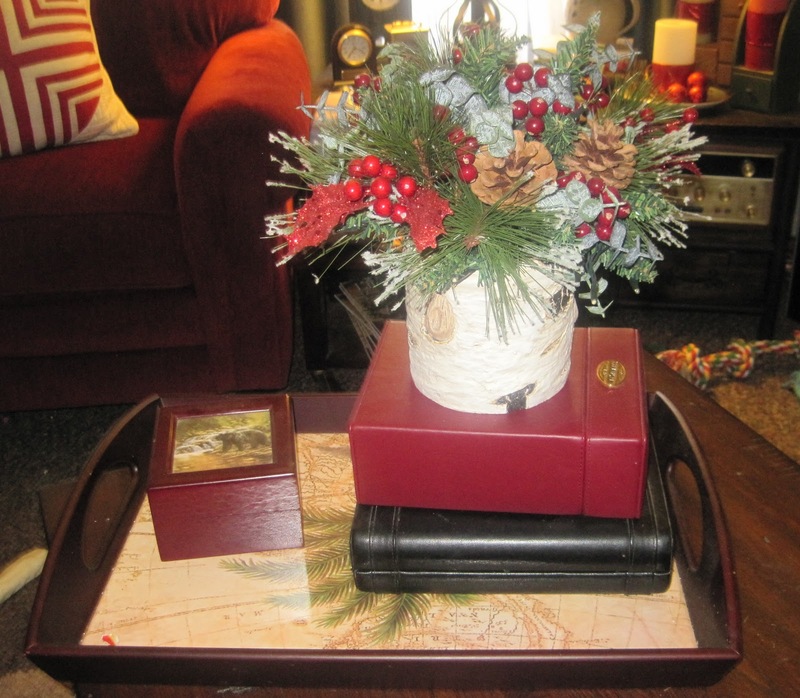 This low table is one of my favorite collection points for seasonal decor. The cluster of flameless candles sits there all the time, but I add ribbon or fabric strips to them, to flow through the seasons. I inherited the love of clocks ... all clocks ... from my father ... and love this little cluster. Lastly, I'll show you one of my favorite pictures ... again! My husband was so fascinated by Miss Phoebe's tiny little fingers and from the first moment he held her, he began teaching her how to count her fingers! I think that must be what accountants do! As a result, she always clutched his big fingers, while he sang her to sleep. She's about a month old in this picture ... and now she's five and sings herself to sleep! I'm posting with Tabletop Tuesday, so make sure you click through to enjoy the other posts. 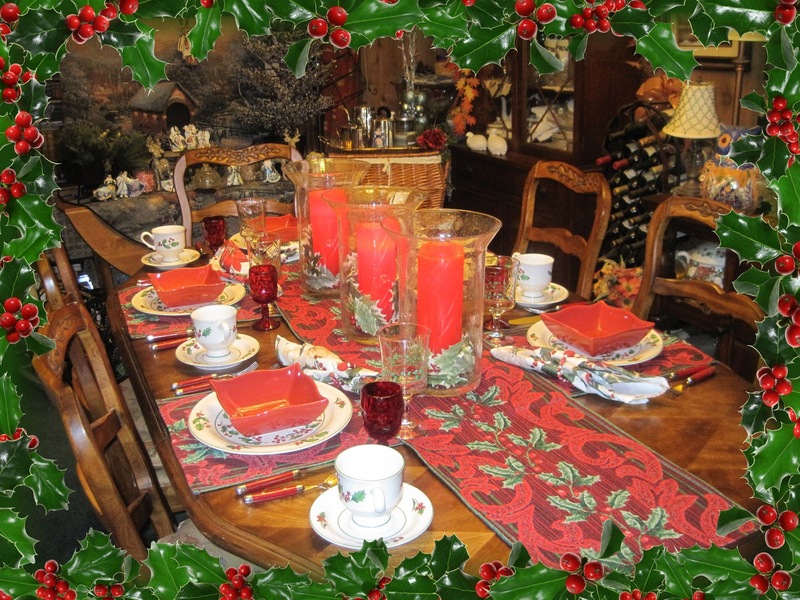 I don't think you can set too many beautiful Christmas tables. 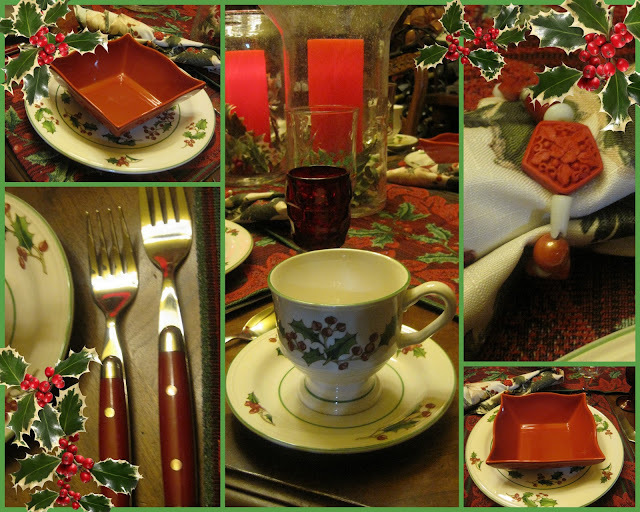 I leave decorations up for a couple weeks into January and enjoy holiday tablescapes through the month! We enjoyed a dinner of homemade red sauce over tortellini and ravioli ... with cheesy garlic bread and Caesar Salad! 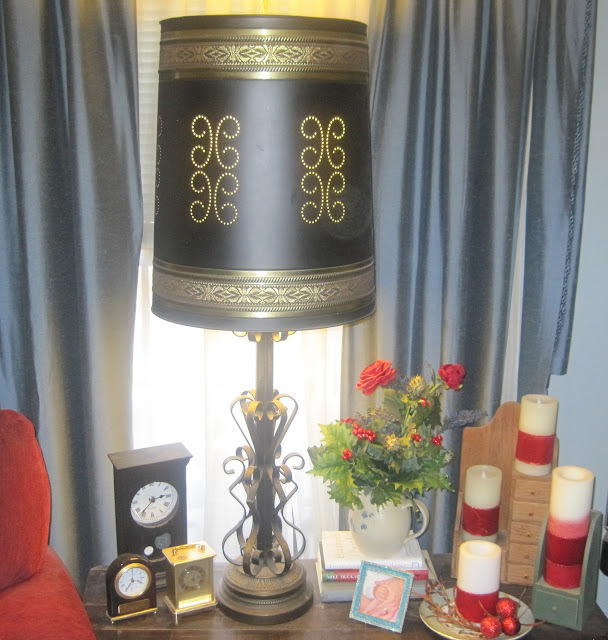 I could probably wrap the Statue of Liberty in my vast collection of table cloths, but when I bought this dining room table last summer, I declared that I would never use a table cloth again! 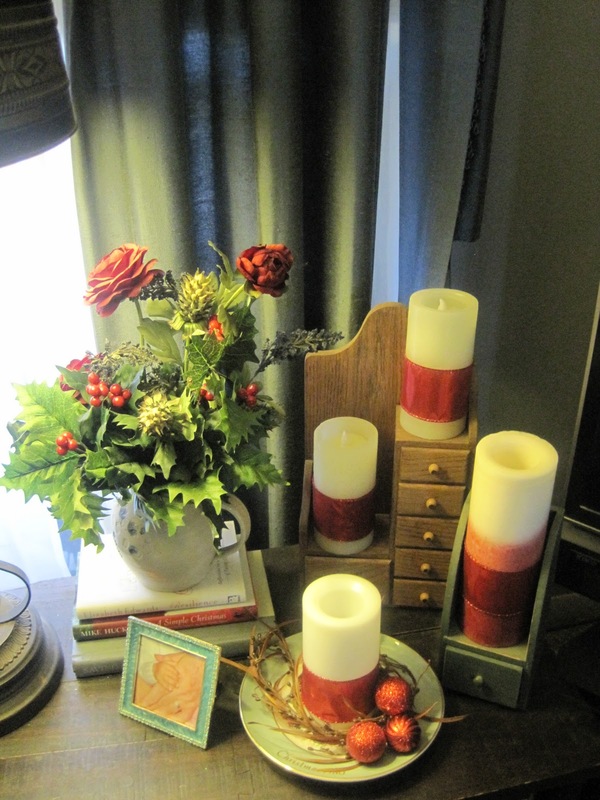 These candle hurricanes are Home Reflections from QVC ... and the big flameless red candles are Candle Impressions. I added silk holly leaves and berries to the hurricanes. the shelves of that antique store! I made my napkin rings. I bought the faux red coral beads and I always have a bag of miscellaneous beads, so it is easy to string a napkin ring on jewelry wire. 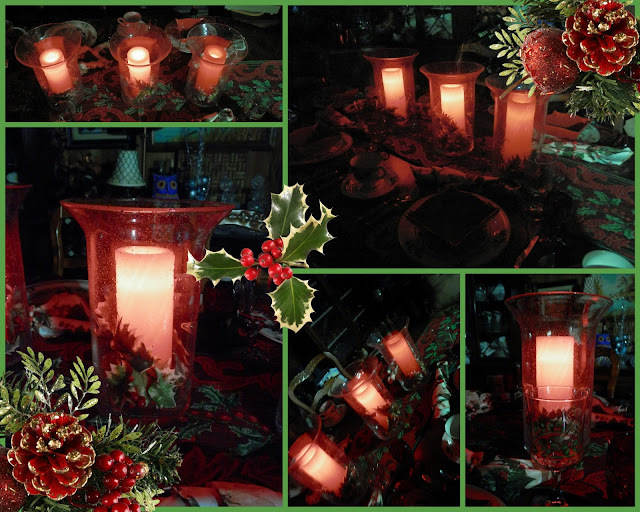 Tables are so pretty in candle light! Please go to my home page and check out my video of tablescapes that I posted during 2011 ... or click my YouTube button and go to my channel to look at several videos. I'm posting with Tablescape Thursday so make sure you click through to see all the other beautiful tables. Special thanks to our hostess!